Icebergs are made of fresh water and float around in sea water, small ones weigh hundreds of tonnes, typical ones weigh 100,000+ tonnes and the biggest ones billions of tonnes. They can be very beautiful and very dangerous. Were do icebergs come from? 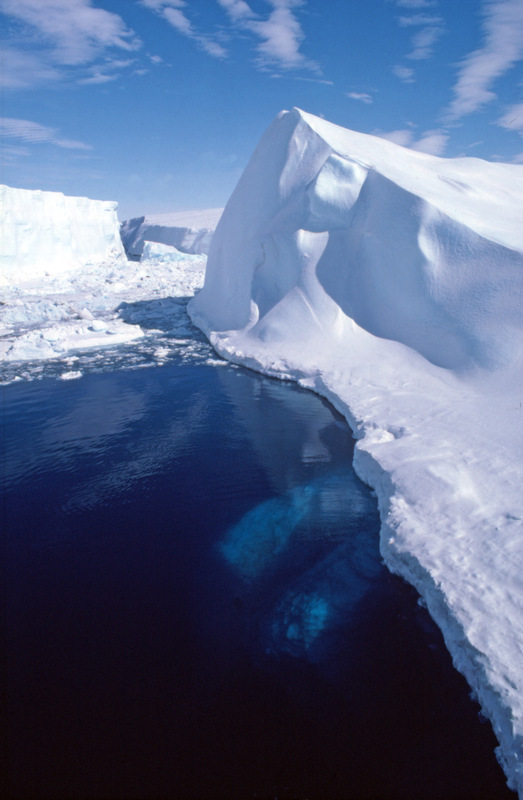 Icebergs start off life as snow falling on on land to form glaciers or ice sheets. They form in the Arctic and Antarctic where they build up over many hundreds or thousands of years flowing downhill towards the sea under their own weight as frozen rivers. Eventually they reach the sea and still pushed by the ice behind them will begin to float on the surface of the sea if the angle they meet it at is shallow, or will break off in pieces if the angle is steeper. 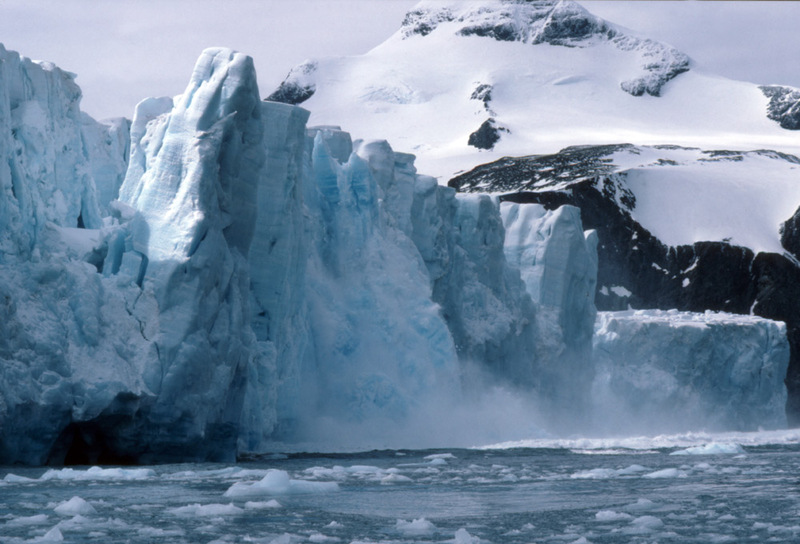 When ice bergs break off from their glacier or ice sheet, they are said to be "calved". Reaching the sea at a shallow angle, a floating ice-shelf may be formed, or if narrow it is called an ice-tongue, this is where the land-based ice sheet continues to push over the surface of the sea and can do so for many miles. Eventually the floating ice sheet forms cracks and pieces break off. This is the way the largest ice bergs form called tabular bergs as they are flat topped like a table, they are also sometimes called ice islands as they are so large and can be long lived, over 5 years or more. They are not always enormous however, many variables determine how regularly pieces fall off which determines how large they are, it can be years between ice bergs being calved from a particular ice-shelf. If a glacier rather than an ice sheet meets the sea, it tends to be at a steeper angle and the ice far more broken up after the passage over uneven bed rock, so chunks of ice fall from the front much more frequently, many times a day in the summer months for fast-moving glaciers. A small iceberg is calved from a small Antarctic glacier, this produced two large pieces about 10m x 5m x 5m and a lot of smaller icy rubble. 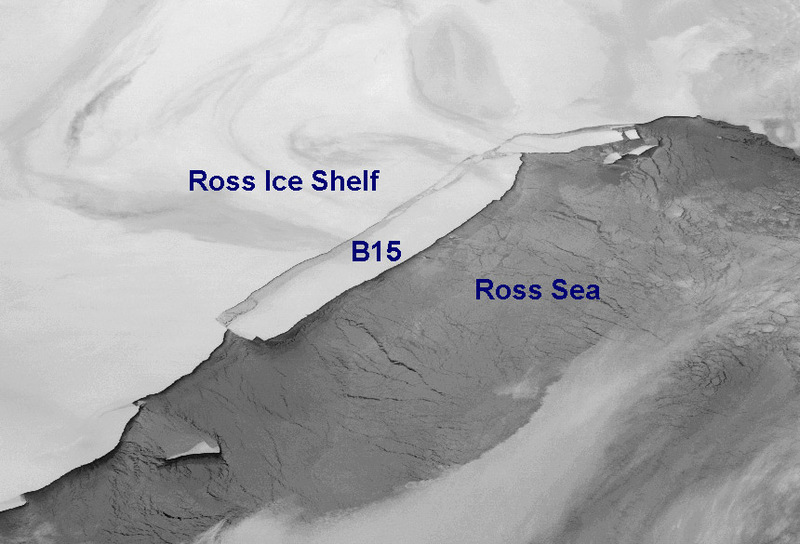 The largest iceberg recently seen being calved from the Ross Ice Shelf in 2000, the berg named B15 was around 295km long and 37km wide, an area of 11,000 square kilometers, larger than many small countries with over 3 trillion tonnes of ice. There is no real definition of what signifies the lower end of the ice berg size scale but anecdotally it is around 5m, anything smaller than this is called a "bergy bit" or "brash ice" if it is icy rubble. Antarctic icebergs can be of both of glacial origin or ice shelf origin, the tabular ice shelf ones are the biggest by a long way, a dimension of 10 miles is not unusual for tabular bergs. The largest iceberg ever recorded was sighted in 1956 by the icebreaker USS Glacier, it was at the time 335 x 97 kilometers, at 31,000 square kilometers nearly three times as large as B15 above. This was at a time before satellite observations and measurements were taken, so it may have originally been even bigger. Tabular bergs can be 40m high out of the water giving a total thickness of around 320m or over 1000 feet. Arctic icebergs are produced from glaciers and so are not going to reach the same sizes, though can still be enormous regularly reaching 70m (230ft) above the water with the largest recorded being 168m (550ft) above sea level though of an irregular shape. 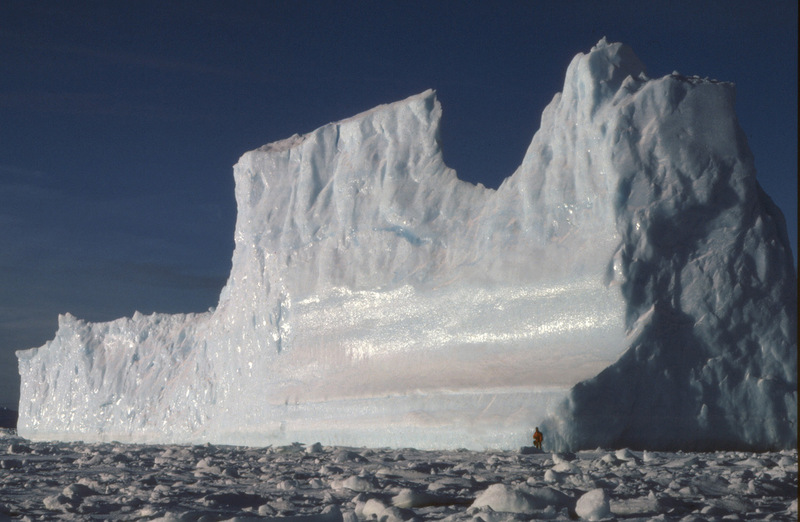 Antarctic glaciers also produce such enormous non-tabular icebergs. An approx. 45m (150 feet) high irregularly shaped Antarctic iceberg. Part of tabular iceberg or ice island B15 in the Ross sea. This iceberg was studied for several years after it was calved in 2000, partly by erecting weather and GPS tracking instruments on it. It is thought that icebergs of such a size are produced once every 50-100 years. How big is the "Tip of the iceberg"? Everybody knows that most of an iceberg lies under the water, but most don't know that the amount beneath the surface varies from about 50% to 99%. 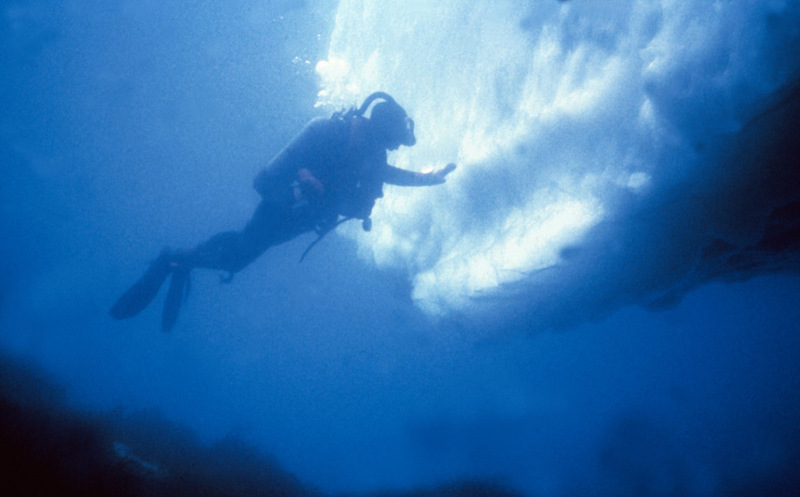 The cause of the variation is largely in the amount of air that is trapped in the ice so affecting its buoyancy. 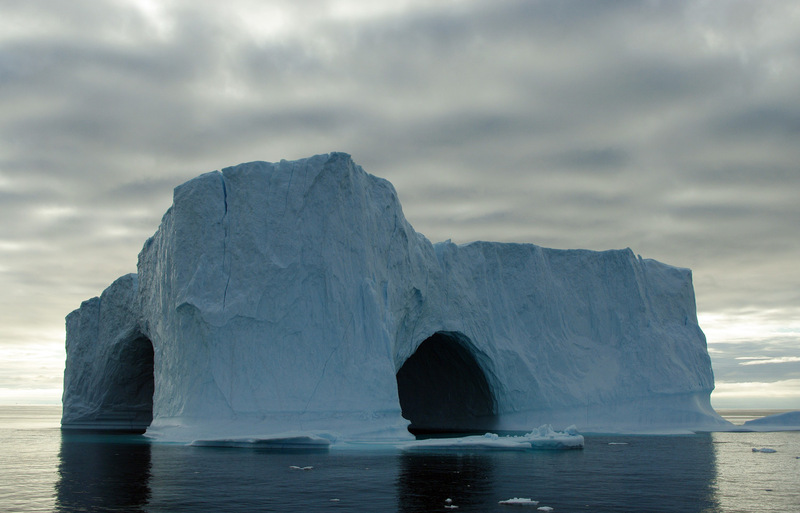 An average iceberg will be about 1/5th to 1/7th above the surface. Very low lying pieces of ice of whatever size in the water are known as "growlers". These tend to be made of very clear ice with little or no trapped air which makes them appear dark in colour from the sea. They are known as growlers because they present a particular hazard to shipping with the small amount visible above the water and the dark colour making them especially difficult to see and therefore especially dangerous. Some icebergs carry rocks and stones of all sizes down to gravel and fine powder so appearing dark grey or black in parts like the one in the picture below. The debris accumulated on the ice when it was part of a glacier becoming frozen into the ice itself. 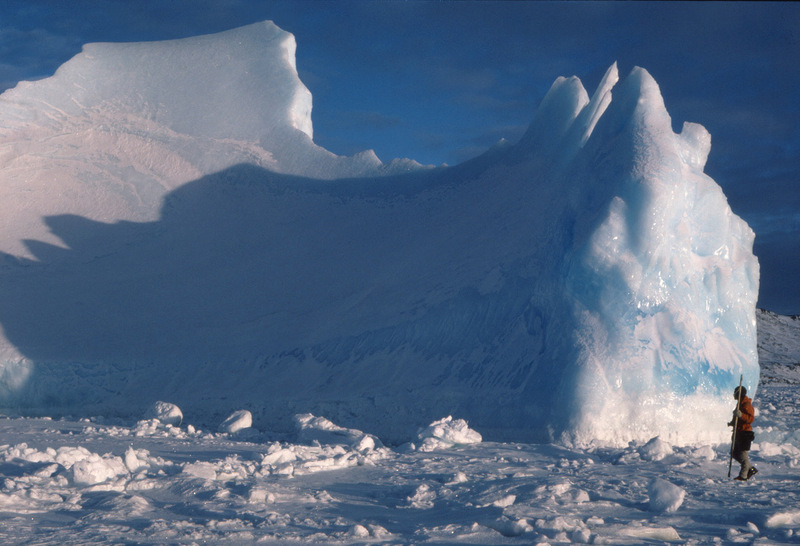 As the berg melts into the sea, this debris is spread around which can result in a fertilizing effect if it is rich in minerals. How can people stand next to icebergs? During this frozen-in time, it is possible to travel out across the sea-ice and walk right up to the bergs. It can be quite magical standing next to an ice-berg, especially when the sun is shining and glistening off the ice. The sun can also penetrate the ice and be reflected off inner surfaces giving a whole variety of effects and colours from white through a range of vivid blues, quite an unreal experience. Less welcome is the fact that the sun warms up the ice making it expand slowly causing a whole range of eerie sounds, creaks and groans with the occasional bang. The knowledge that bergs can tip up even in the winter months makes it a less than comfortable place to want to stand for too long. The surrounding sea-ice also moves up and down the side of the berg with the tide adding to the array of noises. It's quite a humbling experience standing close to an ice berg the size of an office block, particularly when you consider that the bit beneath the thin sheet of ice you're standing on is the size of 8 or 9 office blocks. The whole scale of Antarctica is really quite awesome, such moments and places serve to remind us that we are really quite insignificant to the motions of the planet. These motions that took place before we "discovered" them, continue oblivious to our presence and will still continue when we are no longer around to see them. 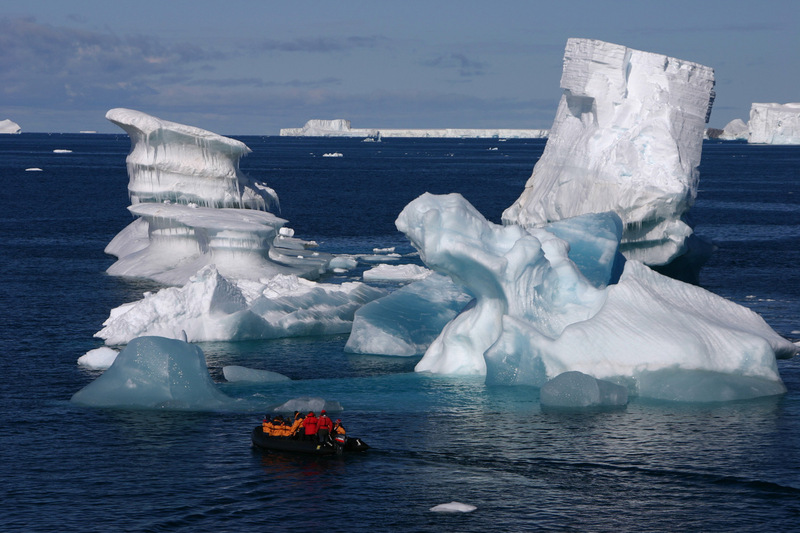 Why are ice bergs so varied in shape, size, colour and pattern? 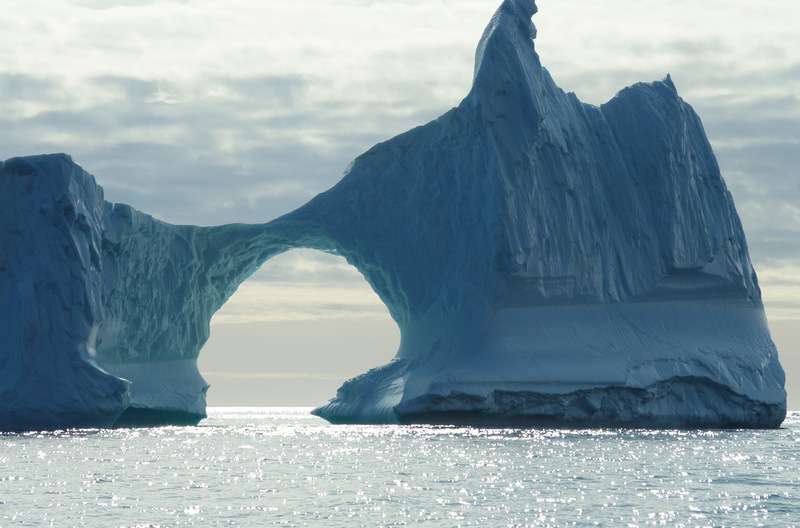 Many icebergs start off life a very irregular shape, though not all of them, those tabular bergs start flat and stable. As they age however, they undergo many changes. Melting is the most obvious change, this can be the part above the water when the temperature goes above freezing point, or less obviously the part below the water when the temperature of the sea water goes above freezing point. Waves and currents erode the edges and underside far from evenly causing internal stresses that can result in fractures along the complex fault lines that exist within all bergs. The result is that the iceberg doesn't simply melt like some giant ice-cube, long before that it will change its center of balance and tip up, it may crack along one of those fault lines and split into two or more pieces. This will happen many times and when it does so it exposes different parts of the berg to the air or sea. 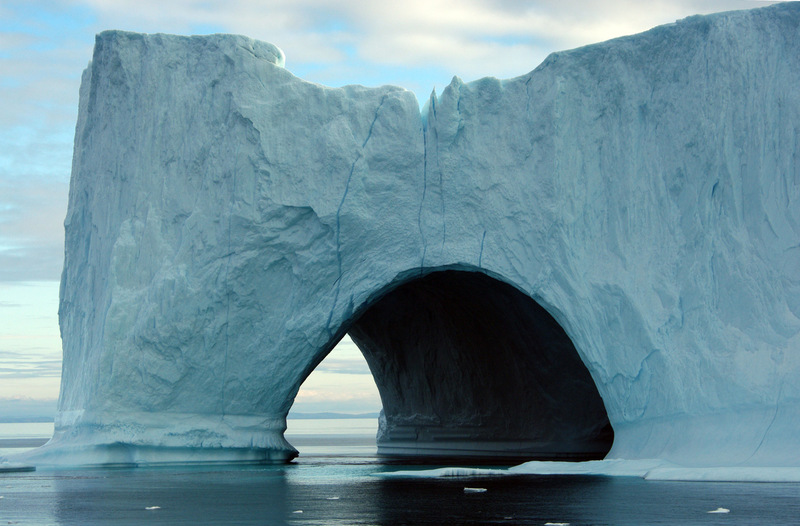 All this erosion and tipping and cracking results in icebergs that vary enormously in shape. 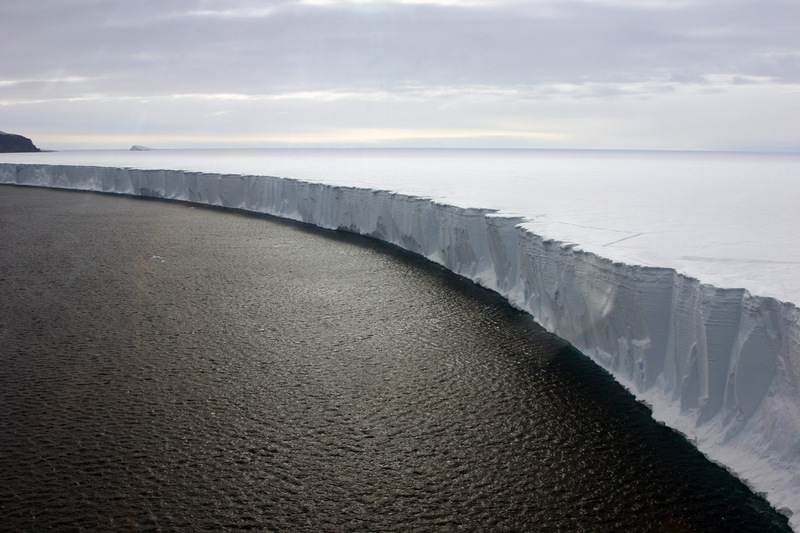 Eventually the berg will erode to pieces small enough to melt away into the sea. If they get caught around the frigid polar seas, it can take years, if they get carried away by currents and winds from the pole however into seas that are just a little warmer, the process speeds up enormously. Icebergs are made of fresh water that started off as snow, falling and accumulating over many hundreds or thousands of years. Often when the snow fell it was very light and contained a lot of air between the flakes and ice crystals. Sometimes when the ice fell it was somewhat warmer and the snow was wetter and heavier, this meant less air was trapped. 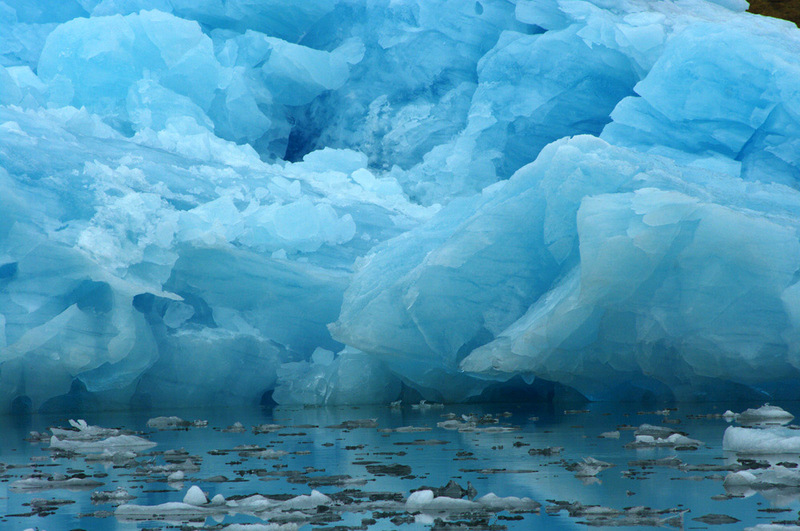 When more air was trapped a layer of what will become whiter ice is laid down, when less air is trapped, a layer of what will become bluer or darker ice is laid down. 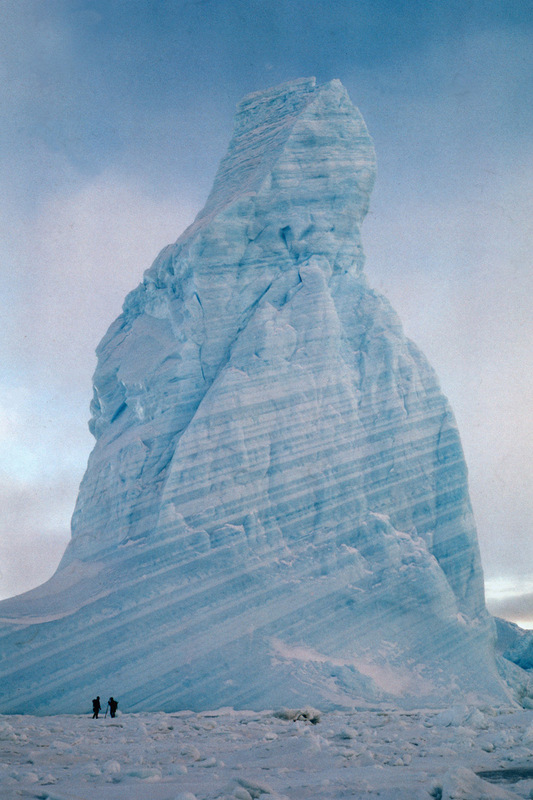 Add to this the effect of the weight of deep burial and longer times of compression of glacial ice before it reaches the sea to become icebergs and we get ice bergs formed in a range of blue shades through to white, often striated showing when snow fell in larger or smaller quantities and warmer or colder conditions. Other lines through the berg at a different angle to the originally horizontal striations are caused by cracks forming as the ice flowed over the land, sometimes cracks opening and closing, sometimes an open crack being filled with spring and summer melt water which then freezes again to give a deeper blue vein. The vast majority of the time icebergs just sit there doing their own thing which consists mainly of bobbing about in the sea or, or maybe resting on the sea bed melting slowly. Every now and then however they tip up or split into pieces, even small icebergs weigh in the region of hundreds of tonnes and many of them being hundreds of thousands or millions or more. They always do tip up and crack at some point. When they do so, you don't want to be anywhere near them, in the winter months they can destroy many square miles of sea-ice around them with the resulting waves. There are stories of people having sledded on strong stable sea-ice past a snoozing berg one day and then the next day seeing the same berg in the middle of several square miles of fractured ice like the difference between a completed jigsaw puzzle and a pile of jigsaw pieces. They can be very tall and ice is very heavy, imagine all that falling or swinging down from 100m or more like the giant hammer of Thor's bigger, stronger and angrier icy cousin. Having said that I've never heard of anyone actually being hurt in such an event - a combination of the rarity of it happening, alertness and speed of the boatman/boat and people just not going near big bergs very often. This is the lesser known danger of icebergs, there is also of course their better known antisocial habit of sinking ships full of people. The most famous iceberg in history has possibly an even less catchy name than B15 as mentioned earlier, it is "The iceberg that sank the Titanic". A fairly typical irregular Arctic iceberg and one of the larger ones from eye witness accounts, calved most probably from the west coast of Greenland at Ilulisat swept down by currents to be hit by the largest ship in the world on its maiden voyage with the loss of 1500 lives. These days ships have radar and can spot bergs as large as the one that the Titanic hit on the 14th of April 1912 from a long way away. 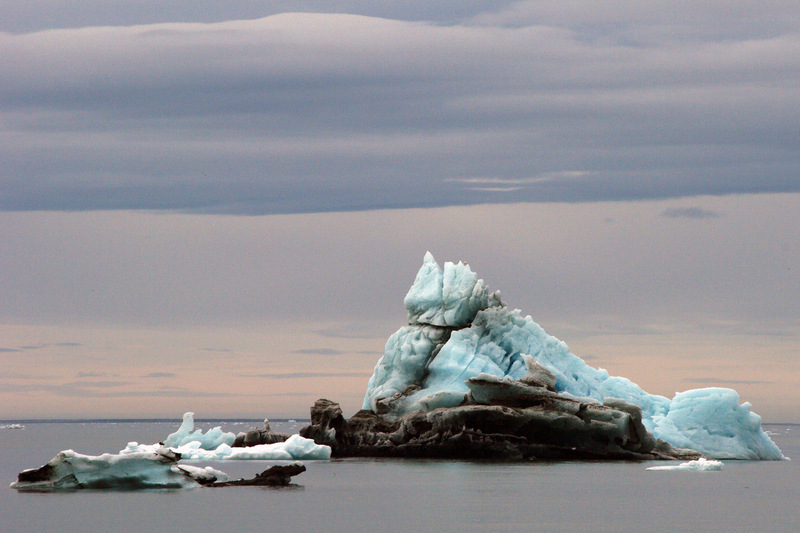 Larger icebergs are tracked by satellites and the information is available to shipping. These methods however are only good for very large icebergs, entering a sea that has many icebergs in a ship with radar results in he screen being covered in reflections from ice, far too many to be of much use. In seas with a lot of ice, there is no substitute for manual observation, having someone on the bridge of the ship watching out for ice and avoiding it. Surprisingly perhaps, it is the smaller icebergs that can be the most dangerous as they are less easy to see. The most dangerous of all are bergs those bergy bits known as "growlers". These smaller very dense pieces of ice that are clear or dark in colour and float low in the water are very hard to see making it more likely that they will be hit. They can go straight through the hull of a small boat travelling at speed or cause fatal damage to larger ships. 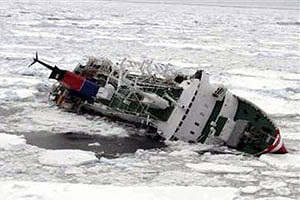 November 2007 the tourist cruise ship M/V Explorer was holed and subsequently sank by an iceberg in the Bransfield Strait Antarctica, the time taken from incurring the damage to sinking was about 15 hours, the ship sank in around 1,500m (4,920 feet) of water. 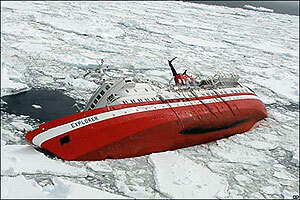 Fortunately, by luck rather than design, there was no loss of life and all passengers and crew were rescued.